I started writing The EDC Tool Roll series last winter at the suggestion of my wife. At the time, I was trying to put together a small, pocketable tool kit that would prevent me from having to trudge all the way back to the shop for a common tool when I was out working on our property. I never anticipated it would take off the way it did, especially when it comes to reader interaction! It has been great hearing from so many of you with tool recommendations or pictures of your EDC Tool Rolls! Trent R. reached out to me to recommend a pair of scissors. I happened to already have the scissors he recommended and I am not sure why it never dawned on me to include them in The EDC Tool Roll because I use them all the time. However, the specific scissors Trent recommended will be profiled in another edition. Today, I want to take a look at what might be the smallest and lightest scissors around that are actually worth using – the tiny, ultra-light SwissCard Scissors from Victorinox. Like the Victorinox Swisstool Plus Replacement Wrench that we recently reviewed (click HERE to read the review), the SwissCard Scissors were never meant to be sold as a stand-alone tool even though they work very well in that roll. These scissor slide into and out of Victorinox’s SwissCard multi-tools and, unlike most of their scissors, are not permanently connected to the host tool. The SwissCard Scissors are spring loaded so that they “spring” open. This makes them surprisingly easy to use in spite of their small size (3″ overall, 1/10″ thick, 7 grams). However, this means that open is the default position unless the scissors are actively compressed. These are wickedly sharp so that is a problem but one that is easy to fix. 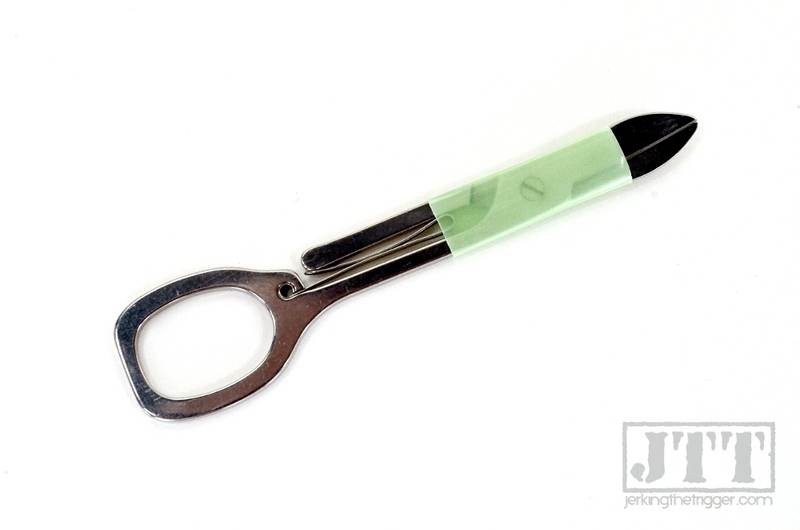 In a SwissCard, there is a specialized compartment for holding the scissors in the close position but since I don’t use the SwissCard, I just slip the scissors into a small section of drinking straw (see image above). The straw adds basically no bulk or weight and keeps the overall package so small that I can store them anywhere. Scissors are just better than a knife for some tasks. These scissors are great in your EDC kit but can also find a home in your hiking gear or first aid kit. I have used them for cutting up patches for a Therm-a-Rest mattress or moleskin to deal with blisters. They can strip wire, cut tape, trim frays on gear, trim your nails in a pinch, and more. If you have them in your kit, you’ll use them. I will profile a few other scissors that I use regularly but this are by far the smallest and lightest. If you want scissors that will fit any EDC Tool Roll, these are what you want. There is room enough in even the most compact kit. I pulled my SwissCard Scissors out of broken SwissCard that was going to be discarded. You are not likely to find these at any brick and mortar store since very few of them carry Victorinox replacement parts. There are various online retailers and auction sites that offer them so shop around. I haven’t reviewed any of these yet, but I own the following alternatives. They will find their way onto these pages eventually. Both are made in the USA! Do you have scissors that you prefer or another tool recommendation that fits The EDC Tool Roll? Tell us about it in the comments below or drop us a line on the Contact page.